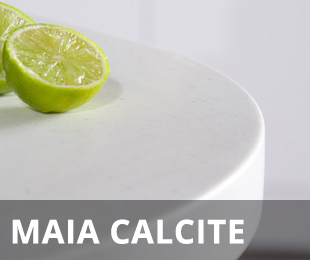 Maia is a durable and stylish solid surface worktop from Sylmar solid surfaces that allows you to join lengths with seamless joints and add a luxurious yet reasonably priced "wow factor" to your kitchen. With 15 colours spread over 2 price groups with a Warranty of 10yrs there is enough choice for everyone. Create the look of smooth composite worktops, avoiding the high cost of solid composite or granite. 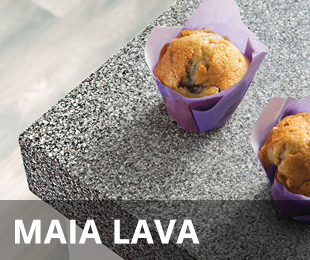 Maia surfaces are impenetrable to dirt, dust and bacteria, easy to clean and heat resistant to up to 180 degrees Celsius making them suitable for any domestic Kitchen or Bathroom area. Choose a sink module and it will arrive with the sink whole already cut-out and drainer pre grooved. Bespoke Worktops are also available upon request. 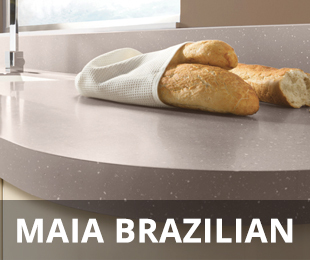 Cut Price Kitchens are recognised as one of the leading suppliers of Maia worktops in the UK. 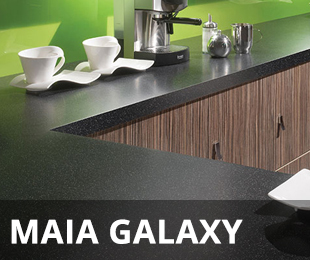 We sell a large amount of Maia worktops (independent of kitchens) so if you would like to give your existing kitchen a new lease of life or finish off your new kitchen with the sleek look with Maia then give us a call on 0117 330 2277 and speak to an expert. 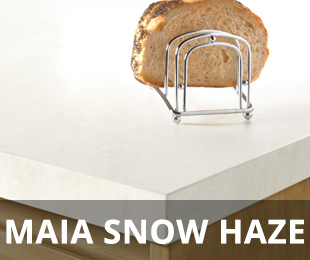 *PLEASE NOTE; once the Maia worktops are ordered the worktops can not be changed or cancelled as the Worktops are made for you and can not be returned for a refund unless damage has occurred during transit,Manufacture is approximately 7-10 working days from time of order as the tops are made on request and delivery to your Postcode area will be subject to where a bouts the delivery address is within Mainland Great Britain.Please make sure there is at least one able bodied person available to assist the driver and we strongly advise you do not book a fitter before you have had your order delivered as manufacturing delays can rarely occur which are out of our control. Please see our Terms and Conditions in our websites footer. Each blank board 1.8m or 3.6m board and the Square Cornered Breakfast Bars are supplied with a 1200mm length of additional edging and a 3m length of heat resistant reflective tape used for hob cut outs. (when using the 1200mm of edging please allow for a 75ml sachet of adhesive .) Radius Ends are manufactured with a 240 degree radius and compliment most new style kitchen doors. Please call our office for further details and prices if you are not sure. Designed to be simple to install Maia offer helpful tips and advise on installation providing a variety of on line videos which can be viewed on their main website or a DVD which can be purchased for full guidance instructions on all aspects of fitting Maia Work Surfaces. Each jointing kit will do one 900mm Max joint and includes everything from adhesive and bolts through to the sanding discs and finishing cloth. The Maia care kit is available to help maintain the look of your finished surface. Any minor scratches or staining which may occur over time can be simply removed using the products provided in the Care Kit. Worktop savers, trivets and Maia’s own Hot Rods are highly recommended as a preventative to prolong the look and appearance of your Maia Surfaces. Customers ark asked to fill in the Warranty card that comes with your purchase and send back to Maia to activate your Warranty or this can also be done on line on Maia’s main website. You were much cheaper than Tesco for the Maia worktops and considering you were already cheaper for the kitchen units I placed the order with you straight away. I am staggered at how cheaply you can sell it as a package and as I have never made a big purchase on the internet like this before, I was really happy that it turned up on the day you promised and was all complete. My wife is over the moon, thanks. Please thank Jill for all her help and advice about the Maia sink modules and curved island worktops. The curves matched the curved base units perfectly and we didn't need to alter anything on site. I am amazed as it really looks like Staron and Silestone worktop samples that we had from the company that quoted for us before, but was dramatically cheaper. I appreciate it is not exactly the same but you could struggle to tell the difference as it is fitted so well. Like most things it seems to be the fitting that makes a big difference. 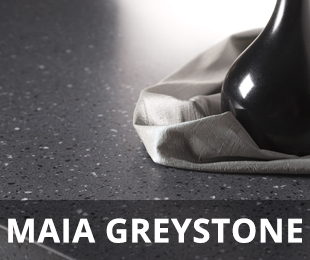 I have seen granite tops which are badly fitted and they can look awful, but the Maia worktops are beautiful. We will recommend you to our friends, great service. Item arrived well packaged and in good time, perfect as I was away the next day! Looking forward to my new kitchen being finished. Great Service, would recommend and use again! I'm not very good on the internet so don't like buying expensive things however it was made so easy once I'd called and got all the advice I needed. It arrived when promised and I'm very happy with the finished kitchen. Looks much better than it would have done if I hadn't had the support from you team. Thank you. I don't usually write reviews but wanted to thank Jill, would never have got everything I needed for my kitchen without your help! Brilliant service and great value. Thrilled with my new kitchen! Brilliant value for money and great service from Cut Price Kitchens. It would have been far more expensive through other websites and they were charging delivery. Kitchen arrived in great time as quoted. Noticed one door was damaged on arrived. Rang and a new one was delivered the next day..fabulous service! Fantastic Service, all complete and no problems with delivery at all. Brilliant service and help, thanks. I was having trouble getting the kitchen I wanted on other websites which just over complicate things! Found this one and was surprised how easy it was to use. I rang to double check I’d done it right and was told I needed a couple of small extra bits and it was done. Easy Website and kitchen looks great. I've recently installed a brand new kitchen into the conservatory. Used the Maia Cappuccino Worktop as I felt like it fitted really well with the colours of the walls. Love it! I had to install my worktop within a few days to surprise relatives before they came over! Worked like a treat, they noticed as soon as they walked in and all loved it. Really gave my flat that little bit of 'glamour' it needed.